I fully understand that this project may seem a little superfluous, but in my world it is not. In my world, I am looking for a silver lining to my very least favorite household chore which is washing dishes. 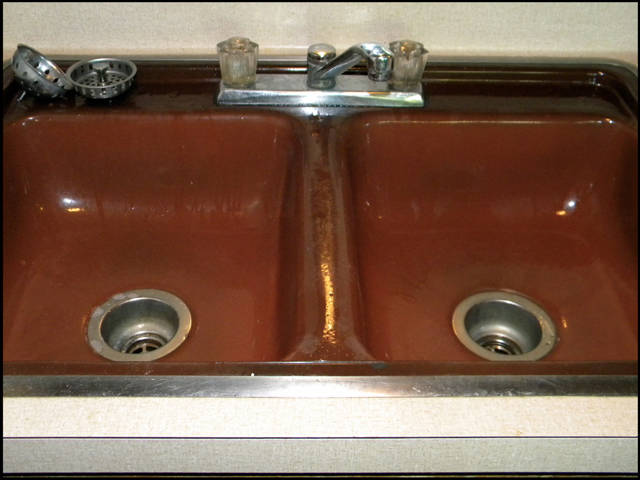 On top of it being my least favorite chore, I am also currently living in an apartment complex with all the original decorative stylings of the 1970s, so I get to do the dishes in the monstrosity pictured below. I love my job and I love that they provide me with a place to live, but my HGTV watching, pinterest pinning heart cries out just a little bit more every time I walk across the speckled linoleum floor and fill up that brown sink with soapy water. Our apartment may be living in the past, but we are members of the Costco cardholding present day. Because of that, we have a jumbo-sized jug of dish soap under our sink that Justin cleverly decided to pour into a smaller hand-soap dispenser that we had used up. That little dispenser was already my favorite part of doing dishes because I get a kick out of the way it squirts the soap onto the dishes when I pound the lever with my fist. (It's the little things, right?) So this week I decided to decorate it in bright, soapy colors. Pick out 2 colors of embroidery floss. 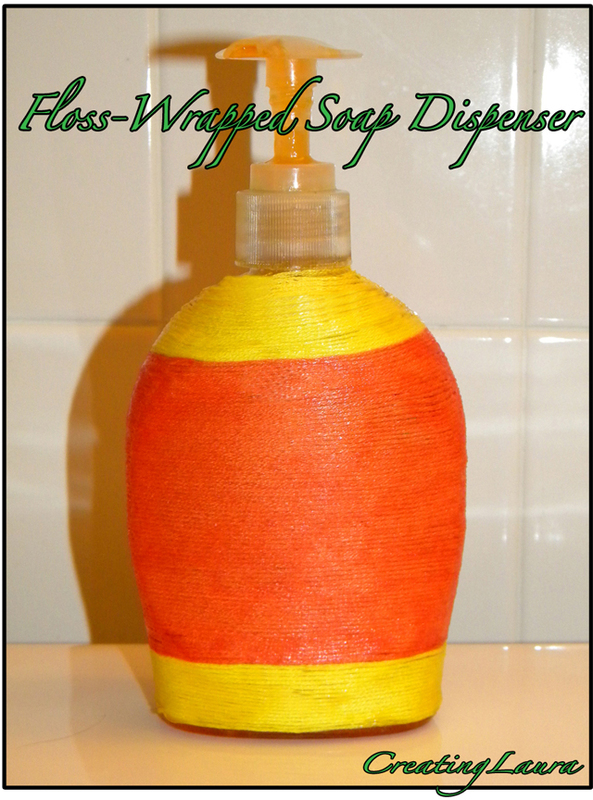 Paint a stripe of mod podge or other craft glue up the side of the soap dispenser so that the floss will have something to help hold it in place while you're wrapping it around the bottle. I used an old bobby pin as a brush, but by all means use a real paintbrush if you have one handy. Begin wrapping the floss around and around the bottle, trying not to leave gaps between the thread. 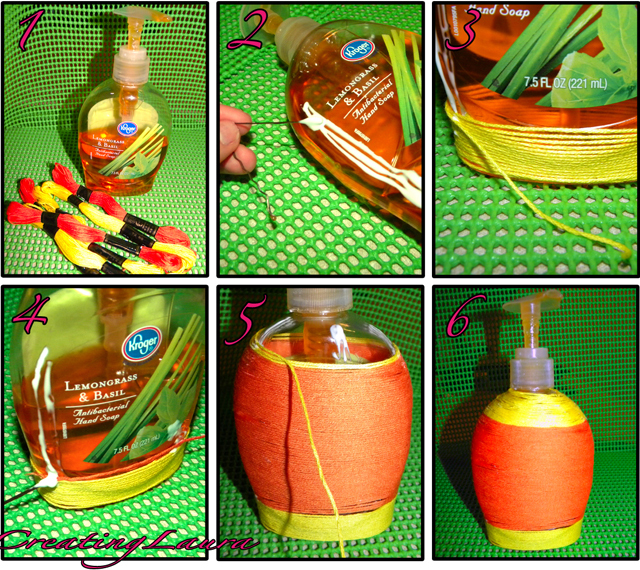 Once you've made a large enough yellow stripe on the bottom, glue the end of the orange floss in the spot where you left off with the yellow and wrap the orange almost all the way up to the top of the bottle. Switch back to yellow for the very top of the bottle. Once you've wrapped the entire thing, coat all of the embroidery floss in a thin layer of mod podge so that the floss will never fall off. Let it dry for a couple of hours and you're finished! Now I smile just a little bit every time I add more soap to the dishes, and isn't that the whole point of crafty DIY projects? To make you smile? 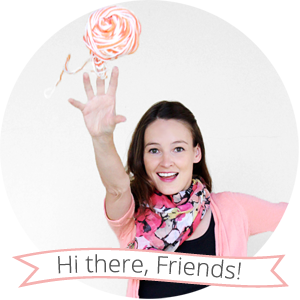 I hope that all of the projects I post on this blog continue to brighten my world in small ways, and I hope that one or two of them might brighten yours as well.